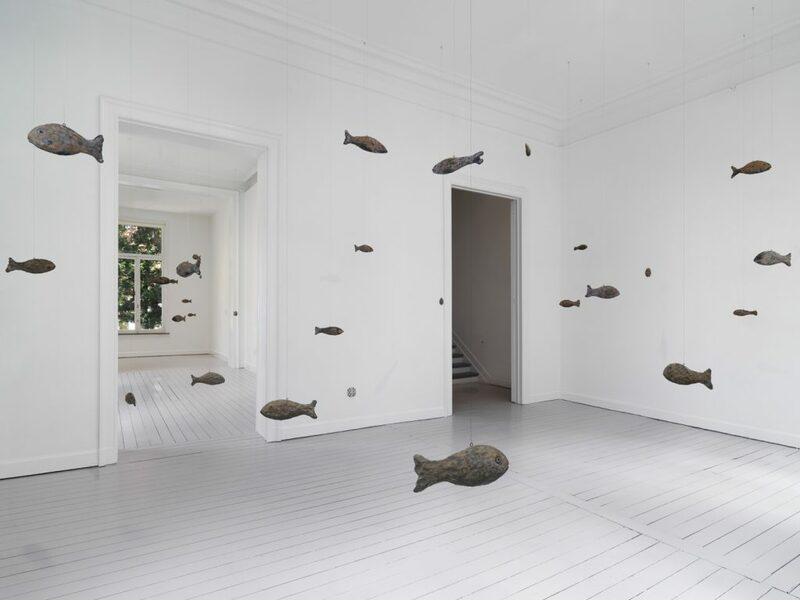 Gladstone Gallery is pleased to present primordial, an exhibition of new works by Ugo Rondinone. 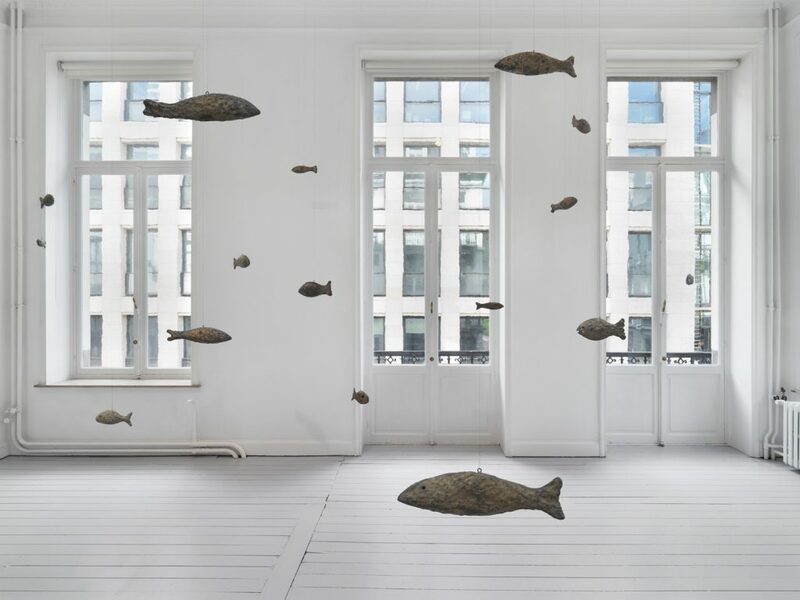 Within the Brussels gallery space, Rondinone creates another universe with forty-seven sculptures: each form is named after a natural phenomenon and embodied by a bronze fish suspended on wire. These sculptures follow in a series that includes bronze-cast birds (primitive, 2011) and horses (primal, 2013). Rondinone’s three groupings of animals stand in for the world beyond the exhibition space, representing the transience and temporality of the natural world. This menagerie of forms belonging to air, land, and water represents timeless occurrences within the cosmos while demonstrating infinite reincarnations. The notion of time is fundamental within Rondinone’s work, reflected in his concept, process, and materials. 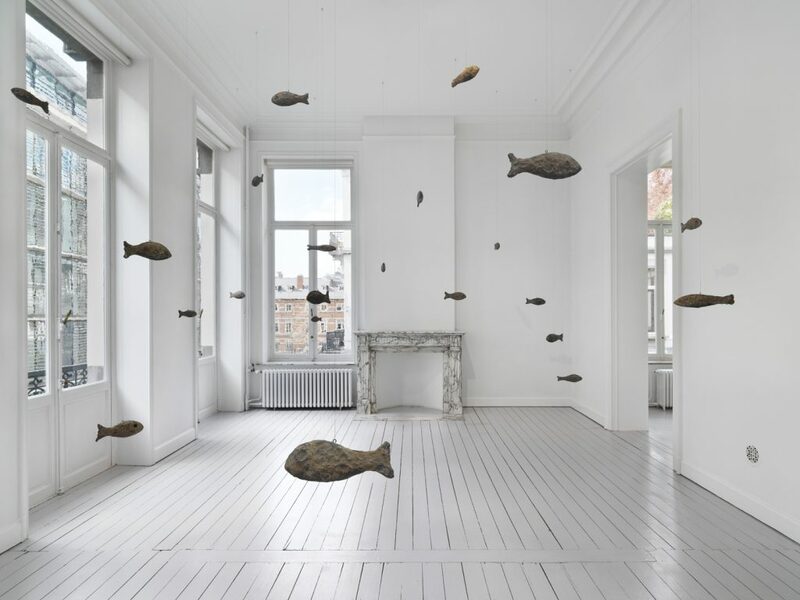 The school of fish in primordial floats quietly and motionlessly unaffected by time. These forms, with titles such as the feather, the insect, or the gravity, serve as amulets of time suspended in mid-air, and provide a contemplative space where the past and present can coexist. For Rondinone, the process of making art is a ritual, and he commemorates the daily by producing one sculpture a day. 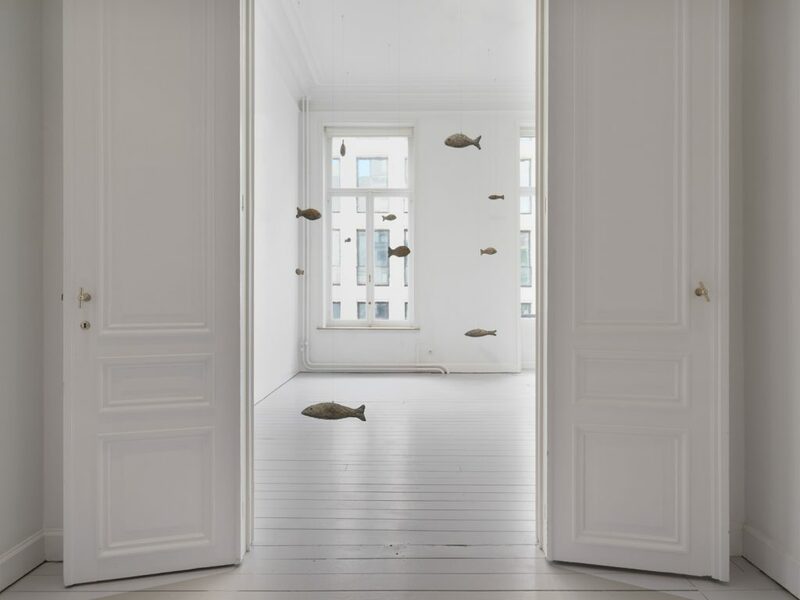 Each fish begins in clay and the evidence of Rondinone’s working process is preserved in the finished bronze, linking each sculpture to his own lifetime through the encapsulated gestures. 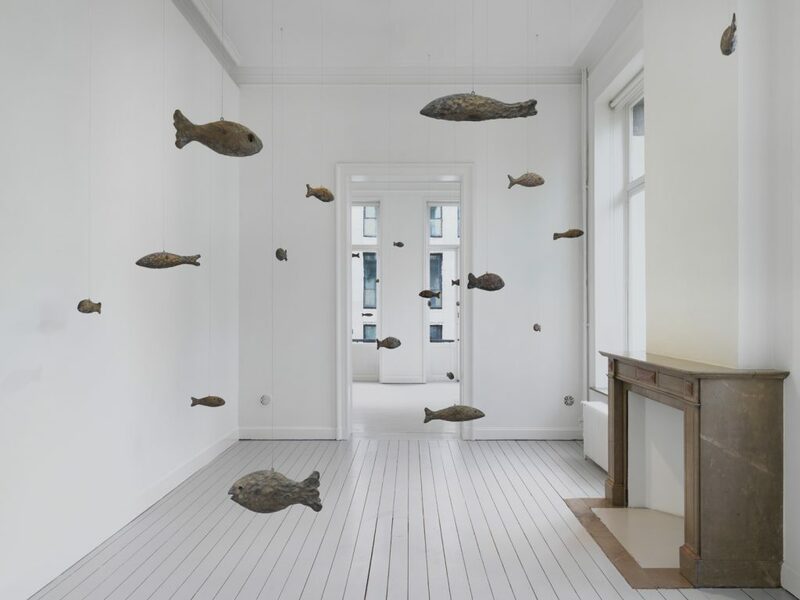 While each of the forty-seven fish is unique, the fish bear a cohesion as they are covered with only Rondinone’s fingerprints. This duality, along with contrasts between organic and inorganic, movement and stillness, as well as mass and weightlessness, present a disparity between the exterior and interior. Over the last decades, Rondinone has created a strikingly diverse body of work exploring conditions of human life and the transience of existence. His paintings range from large Arcadian landscapes to striped or radial gradients named after the dates when the works were completed. Rondinone’s sculptures extend from small still-life objects to colossal bluestone figures.